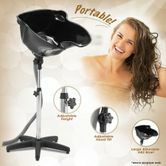 A Large Mobile Hair Washing Basin is a versatile companion for any hairdresser on the move! Are you starting your own hairdressers or taking the show on the road? Crazy Sales has a range of hairdressing supplies to compliment your hair salon and keep your customers satisfied. This piece of hairdressing equipment will bring practicality, style and convenience to your salon, whether it's mobile or not. The hair basin sits firm and stable on a five point base without wheels, to keep it from sliding around when you are washing a client's hair. This hairdressing basin is conveniently adjustable to suit the height of the client and the hairdresser to ensure both are comfortable. This stylish hair salon furniture piece creates space and movement whilst providing a quality function that will contribute to improving your hairdressing business. 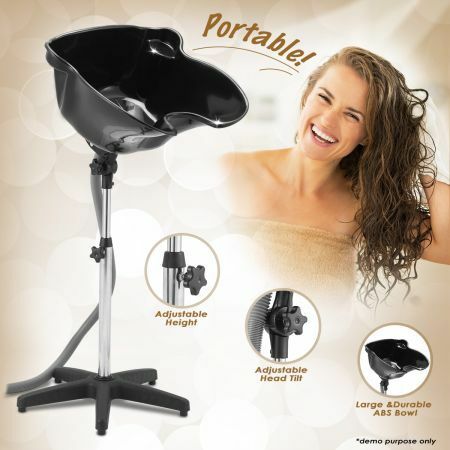 Get a Mobile Hair Washing Basin today! Very fast service. Thank you.